Delayed diagnosis was also a risk factor. Did lack of services during the early school years set some kids on a downward path? Perhaps they were subjected to disciplinary reprimands rather than autistic support services? Or could delayed diagnosis be a marker for some wider problem, such as family dysfunction? We just don’t know. Parental loss and physical abuse were risk factors in both atypical and neurotypical subjects. Neglect, on the other hand, carried no apparent risk for neurotypical subjects, but was the single biggest risk factor for children on the spectrum: Children in the “Criminal” group were 15 times more likely to report that they had been neglected than non-criminal controls. What about these early events is so damaging? … It is our belief that mediating variables between the adverse event and the criminal outcome are neurobiologic dysregulation and attachment pathology… Accumulating adverse experiences in one’s childhood decreases an individual’s subsequent ability to form secure attachments to others…In some boys, the intensely negative feelings stimulated by poor treatment from their attachment figures are associated with either an avoidance of intimacy, or a “bleeding out” of the feelings into their intimate relationships [as adults], in the form of violence. What about the child on the autism spectrum, who starts out with neurobiologic dysregulation and impaired attachment? Could this be why “Neglect” spiked out so dramatically in the ASD subjects, while it didn’t even register a blip with the NT subjects? Or, perhaps there was no actual neglect, but the subjects who went on to criminal behavior felt that they were being neglected. (The questionnaire, after all, was based on self-report.) Perhaps the perception of neglect is tied to the degree of social impairment: difficulty perceiving parental attention may be on the flip side of the coin from difficulty relating to people. We just don’t know. How many of us have ever asked a child on the spectrum: “Do you feel neglected?” Maybe we should start! This brings us to the subject of the core features of ASD, and how they may be interacting with environmental variables. 1. 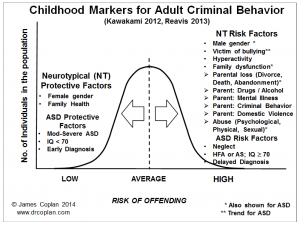 Reavis, J.A., et al., Adverse childhood experiences and adult criminality: how long must we live before we possess our own lives? The Permanente journal, 2013. 17(2): p. 44-8. 2. 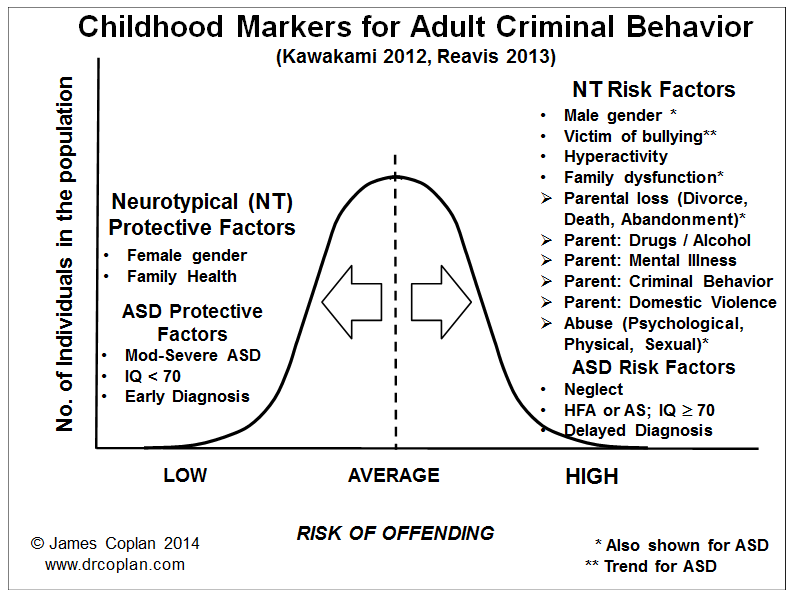 Kawakami, C., et al., The risk factors for criminal behaviour in high-functioning autism spectrum disorders (HFASDs): A comparison of childhood adversities between individuals with HFASDs who exhibit criminal behaviour and those with HFASD and no criminal histories. Research in Autism Spectrum Disorders, 2012. 6(2): p. 949-957. James Coplan, MD is an Internationally recognized clinician, author, and public speaker in the fields of early child development, early language development and autistic spectrum disorders.